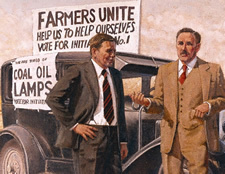 In 1929, the Washington State Grange, a populist agricultural organization, collected more than 60,000 signatures – twice the number necessary – to send Initiative No. 1 to the Legislature, allowing rural communities to form their own publicly owned utilities. When the Legislature failed to act, the measure went to a statewide election, where it passed in 1930 with 54 percent of the vote. The new PUD law went into effect in 1931. In 2000, as access to the Internet became increasingly important, the law was amended to include wholesale broadband telecommunications service. The first PUD to go into operation was PUD No. 1 of Mason County. Formed in 1934, the PUD began serving Hoodsport and the surrounding area in 1935. A second PUD – Mason PUD No. 3 – was formed soon afterwards and now provides electricity to other parts of the county. Mason No. 1 also provides water and sewer services, while Mason No. 3 provides broadband telecommunications. 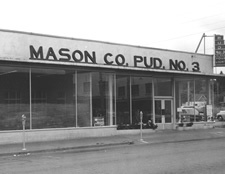 Mason is the only county with two operating PUDs. In 1934, voters in Benton and Franklin counties approved the first countywide PUDs. However, in 1940 the Skamania County PUD, which received voter approval in 1939, was the first countywide PUD to actually begin operations. Early efforts to organize public utility districts often faced fierce opposition from privately owned utility companies. But after the state Supreme Court upheld the PUD law in 1936, the Washington State Grange organized an all-out effort to get PUDs on ballots across the state. The newest PUD is the Asotin County PUD. Asotin PUD was created in 1984 by voters who were upset with the high cost of water provided by a private utility. After two years of court proceedings, the PUD acquired the Clarkston General Water Supply Co. through condemnation and began operations in April 1987. In 1936, soon after the first public utility districts were organized, 34 PUD commissioners gathered at the Grange headquarters in Seattle to form a trade association. Initially known as the Washington Public Utility Commissioners Association, that organization is now the Washington Public Utility Districts Association, which represents the interests of its members in Olympia, the Northwest region, and Washington, D.C. In 2007, the WPUDA moved from Seattle to Olympia, where it built the first new office building in Washington to be certified “Platinum” under the U.S. Green Building Council’s Leadership in Energy and Environmental Design (LEED) program. In 1937 Congress passed the Bonneville Power Act which was signed into law by President Roosevelt on August 20 of that year. 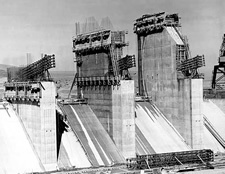 The Act established the Bonneville Power Administration to market the power produced at the federal dams (Bonneville Dam was completed in 1938 and Grand Coulee in 1941). The Act included a “preference clause” which gives “preference and priority in the use of electric energy to public bodies and cooperatives.” This means that consumer-owned utilities, including PUDs, have first right to the low-cost Federal power produced at the federal dams. Preference ensures the benefits of the Columbia River hydropower is be delivered to the citizens of the Pacific Northwest. Preference means PUDs that are customers of the Bonneville Power Administration have first access to the relatively low-cost, clean and renewable hydropower produced by the federal hydro system which they purchase cost. Access to this low-cost, clean energy resources helps keep rates affordable for PUD customers. Many PUDs get all or most of their power from the Bonneville Power Administration. BPA now markets electricity generated by 31 hydroelectric dams on the Snake and Columbia rivers. In 1953, the state Legislature also enacted a law allowing public utilities to form joint operating agencies. 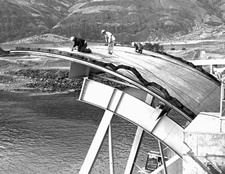 Four years later, 17 public utility districts organized the Washington Public Power Supply System, which opened the Packwood Hydroelectric Project in Lewis County in 1964. Now known as Energy Northwest, the agency also owns and operates the 1,150-megawatt Columbia Generating Station, the only commercial nuclear power plant in Washington, which began operation in 1984. Today, there are 28 public utility districts in Washington: 24 provide electricity, 19 provide water or sewer services, and a growing number provide access to broadband telecommunications.